Advances in genome-wide molecular cytogenetics allow identification of novel submicroscopic DNA copy number alterations (aCNAs) and copy-neutral loss of heterozygosity (cnLOH) resulting in homozygosity for known gene mutations in myeloid neoplasms. We describe the use of an oligo-SNP array for genomic profiling of aCNA and cnLOH, together with sequence analysis of recurrently mutated genes, in a patient with myelodysplastic syndrome (MDS) presenting with normal karyotype and FISH results. 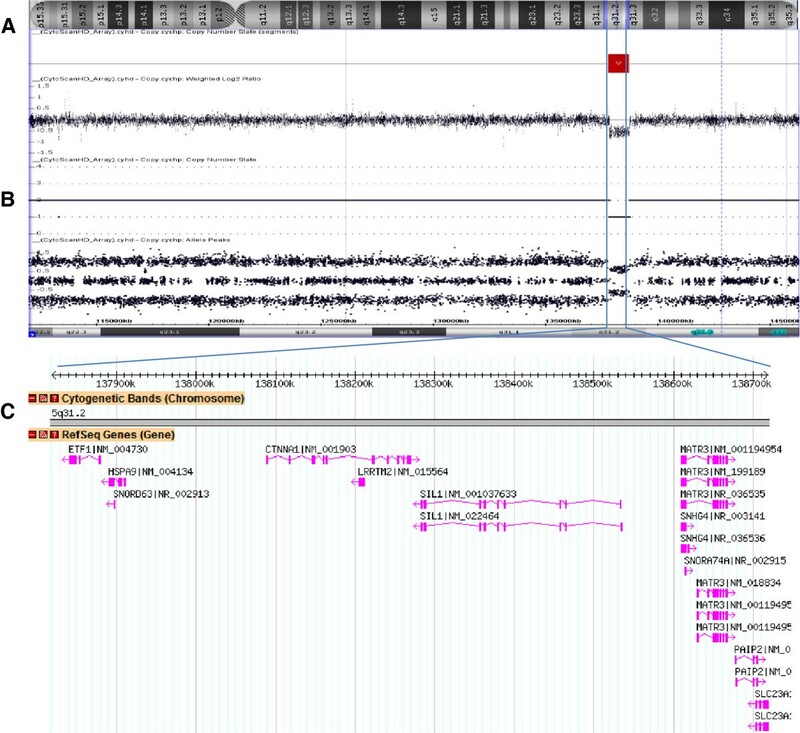 Oligo-SNP array analysis revealed a hemizygous deletion of 896 kb at chromosome 5q31.2, representing the smallest 5q deletion reported to date. The deletion involved multiple genes, including two tumor suppressor candidate genes (CTNNA1 and HSPA9) that are associated with MDS/AML. The SNP-array study also detected 3 segments of somatic cnLOH: one involved the entire long arm of chromosome 4; the second involved the distal half of the long arm of chromosome 7, and the third encompassed the entire chromosome 22 (UPD 22). Sequence analysis revealed mutations in TET2 (4q), EZH2 (7q), ASXL1 (20q11.21), and RUNX1 (21q22.3). Coincidently, TET2 and EZH2 were located at segments of cnLOH resulting in their homozygosity. Loss of heterozygosity affecting these two chromosomes and mutations in TET2 and EZH2 are indicative of a myelodysplastic syndrome with a poor prognosis. Deletion of the tumor suppressor genes CTNNA1 and HSPA9 is also likely to contribute to a poor prognosis. Furthermore, the original cnLOHs in multiple chromosomes and additional cnLOH 14q in the follow-up study suggest genetic evolution of the disease and poor prognosis. This study attests to the fact that some patients with a myelodysplastic syndrome who exhibit a normal karyotype may have underlying genetic abnormalities detectable by chromosomal microarray and/or targeted mutation analyses. 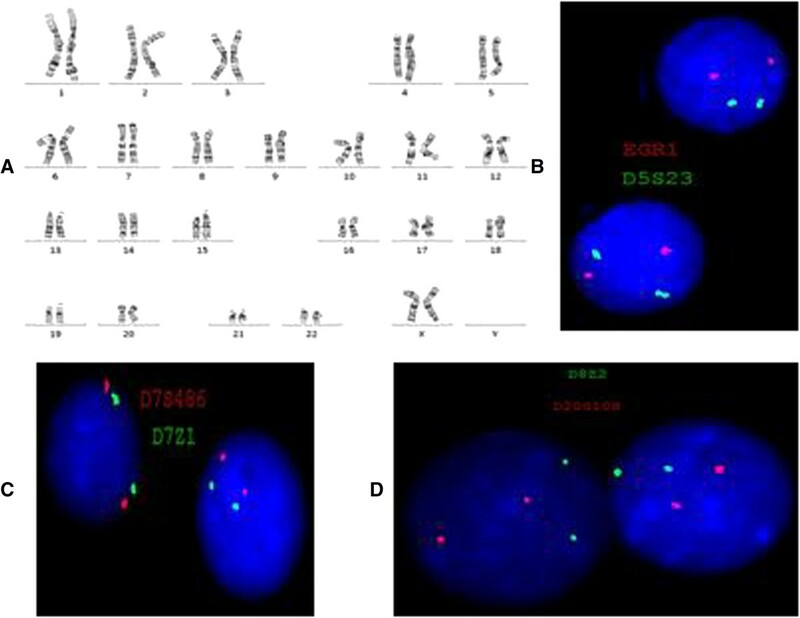 Recent advances in genome-wide molecular cytogenetics allow the identification of novel molecular abnormalities [1–8]. Emerging data demonstrate that myelodysplastic syndrome (MDS) exhibits abundant CNAs and cnLOH, often in the setting of a normal karyotype [9–11]. Loss of heterozygosity (LOH) is an indicator of neoplastic evolution and disease progression [12, 13]. Copy-neutral LOH (cnLOH) arises either via a hemizygous deletion in one homolog and duplication of the other, or uniparental disomy (UPD). Both types of somatic LOH have been observed in studies of various cancer types and may explain some of the mechanisms by which tumor suppressor genes (TSGs) are inactivated or activating mutations in oncogenes are duplicated. Acquired UPD (aUPD) is now understood to be common in oncogenesis and appears to be a mechanism to increase the allelic burden of the mutated genes [14–24]. Thus, it is important to know the regions of cnLOH to determine new regions containing potential mutational targets affecting disease pathogenesis and treatment outcome [25, 26]. Application of SNP-array technology has led to the identification of recurrent regions of cnLOH in a majority of the chromosomes [4, 13, 25, 27–30] and recurrent pathogenic mutations. These findings have greatly advanced our understanding of the molecular mechanisms of cancer evolution and have led to the development of therapeutics and diagnostic tests. In this respect, mutation analysis helps further stratify neoplasms and their treatment outcome [31–34]. In this study, we used SNP array-based genomic profiling to detect acquired copy number alterations (aCNA) and cnLOHs, together with sequence analysis of genes commonly mutated in MDS, in a patient with normal chromosome and MDS FISH (fluorescence in situ hybridization) panel results. An 88-year-old woman presented with leukocytosis (16.2×109/L) including minimal monocytosis (1.0×109/L), mild anemia (HGB 105 g/L), and moderate thrombocytopenia (79×109/L). 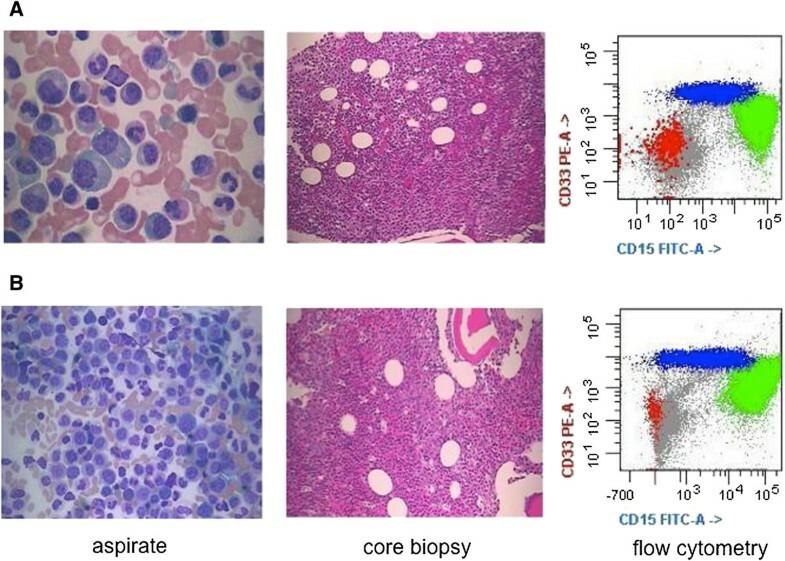 Bone marrow morphologic and flow cytometric examinations revealed hypercellular bone marrow with granulocytic predominance with left-shifted and unusual maturation, and occasional atypical granulocytes and megakaryocytes, but no significant increase in monocytes or myeloblasts (Figure 1). A myeloid neoplasm positive for CD13 and CD33 was diagnosed, best classified as MDS, refractory cytopenia with multilineage dysplasia. Data on therapeutic interventions were not available for this study. At the 5-month follow-up, the overall morphologic and immunophenotypic findings were similar to those at initial presentation. Morphologic and immunophenotypic findings. A) At presentation, there was granulocytic predominance with progressive maturation and no significant increase in blasts or monocytes. The core biopsy shows hypercellular bone marrow with left-shifted granulocytic predominance. Flow cytometry reveals granulocytic predominance (in green) but no significant increase in monocytes (in blue) or myeloblasts (in red). B) At follow-up, the morphologic and immunophenotypic findings are similar to those at presentation. Bone marrow cells were cultivated for 24 and 48 hours in RPMI 1640 or Marrow Max Medium with 10% fetal calf serum (Life Technologies, Grand Island, NY 14072, USA). In total, 20 mitoses were analyzed according to the ISCN (International System for Human Cytogenetic Nomenclature), with a resolution of 300 bands per haploid karyotype. FISH analyses using a panel of MDS probes (-5/5q-, -7/7q-, +8 and 20q-; Vysis, Downers Grove, IL, USA) and BlueGnome probes RP11-114B12 (Illumina, San Diego, CA, USA) for the deleted region 5q31.2 were performed on interphase cells according to the manufacturer’s protocol. Subsequently, 200 cells were examined carefully. Microdeletion/microduplication screening was performed using an SNP-array platform (CytoScan HD SNP array; Affymetrix, Santa Clara, CA), following the manufacturer’s instructions. The CytoScan HD array has 2.67 million probes, including 1.9 million copy number probes and 0.75 million SNP probes. 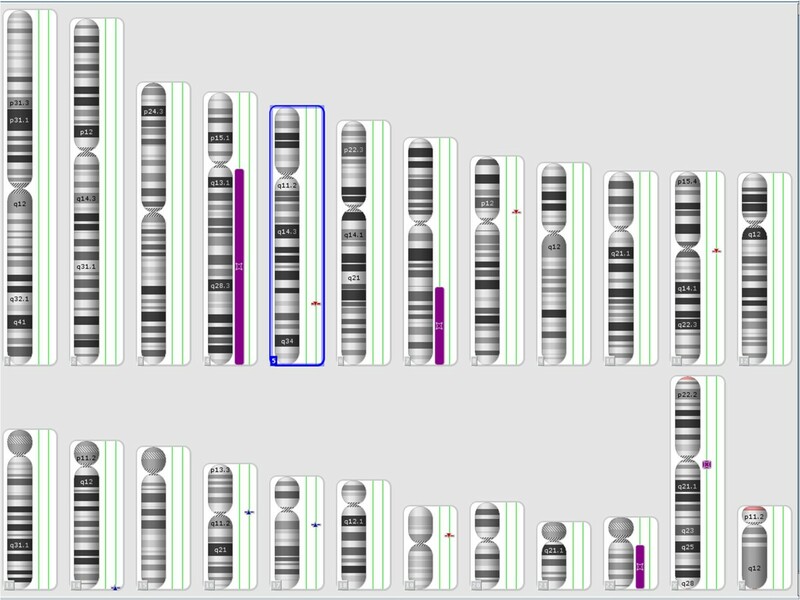 Array data were analyzed using the Chromosome Analysis Suite (ChAS) software v 2.0 (Affymetrix). Genomic DNA was also tested for mutations in 19 genes that are recurrently mutated in myeloid neoplasms, including ASXL1, EZH2, RUNX1, IDH1, IDH2, KRAS, NRAS and TET2. Sequencing was performed using a TruSeq custom amplicon assay on the MiSeq sequencing platform (Illumina, Hayward, CA). Analysis was performed using SeqPilot software (JSI Medical Systems, Costa Mesa, CA). The assay had sufficient read depth to provide a minimum sensitivity of 5% to 10% for mutation detection. During the initial evaluation of the patient, cytogenetic analysis revealed a normal karyotype and FISH studies were negative for aCNAs commonly seen in MDS (MDS panel) (Figure 2A-D). Microarray analysis revealed a microdeletion of approximately 896 kb at the 5q31.2 chromosomal region and three segments of somatic cnLOH for the entire long arm of chromosome 4 (136 Mb), the distal half of the long arm of chromosome 7 (50 Mb), and the entire chromosome 22 (31 Mb). The microdeletion at 5q31.2 extended from 137,821,899 to 138,718,504 bp (UCSC genome Browser; http://genome.ucsc.edu/; hg19 release) and included the ETF1, HSPA9, SNORD63, CTNNA1, LRRTM2, SIL1, SNHG4, MATR3, SNORA74A, PAIP2, and SLC23A1 genes (Figure 3). Routine cytogenetic and fluorescence insitu hybridization (FISH) results. A) G-banded chromosome analysis shows a normal female karyotype. B-D) FISH analyses show normal hybridization with an MDS panel using probes for EGR1 (5q31, red signal) and its control probe D5S23 (5p15.2, green signal) in B; D7S486 (7q31, red signal) and its control probe D7Z1 (7centromere, green signal) in C; CEP8 (green signal) for chromosome 8 centromere and D20S108 (20q12, red signal) in D.
5q31.2 deletion. 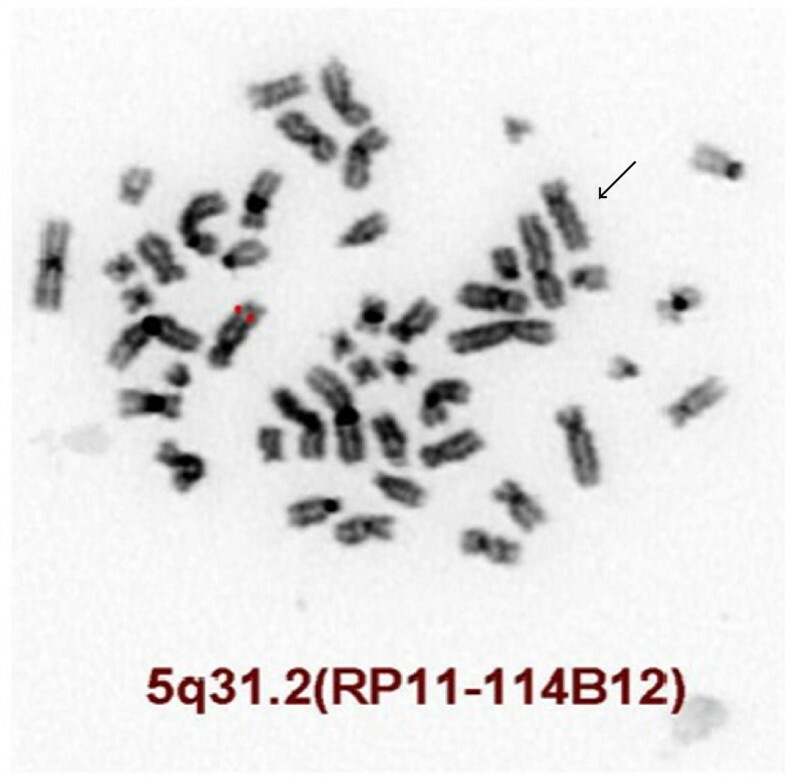 A) Chromosome 5 with deletion at q31.2. B) SNP-array results, including the weighted log2 ratio, copy number state, and allele peaks at the deleted region. C) Database of genomic variants showing an 896-kb deletion in the short arm of chromosome 5 within band q31.2 (position 137,821,899 to 138,718,504), including the CTNNA1 and HSPA9 genes. Of the genes deleted due to this microdeletion, two are tumor suppressor candidate genes associated with MDS/AML: CTNNA1, which encodes alpha-1 catenin, and HSPA9, which encodes heat-shock 70-KD protein 9 (mortalin) . Deletion of CTNNA1 was confirmed by applying BlueGnome FISH probes (RP11-114B12) (Figure 4). Alpha-catenins such as that encoded by CTNNA1 are essential for the regulation of cell-cell and cell-matrix interactions in tissues . Loss of expression of the CTNNA1 tumor suppressor gene in hematopoietic stem cells may provide a growth advantage that contributes to human MDS/AML with 5q deletion . Furthermore, loss of the CTNNA1 expression has been associated with leukemia progression or transformation of MDS to AML . The HSPA9 gene is also located at the 5q31.2 region frequently deleted in MDS/AML, making it a candidate tumor suppressor gene; this is consistent with the biological function of its murine homologue. Human mortalin (encoded by HSPA9) was originally identified by its close homology to murine mortalins, which play important roles in cellular senescence . The HSPA9 gene is a novel negative regulator of Raf/MEK/ERK pathway that may be a potential therapeutic target . FISH inverted DAPI image showing deletion of the CTNNA1 gene using the BlueGnome FISH probe RP11-114B12 (5q31.2, red signal). The deleted chromosome 5 is indicated by an arrow. The combined size of cnLOHs spanning at least 10 Mb across the genome was approximately 217.6 Mb (Figure 5). These were detected at the long arm of chromosomes 4, 7, and 22. The cnLOH might result from mitotic recombination or nondisjunction which leads to segmental or whole chromosomal UPD, respectively . Acquired UPD (cnLOH) at diagnosis in our case is indicative of neoplastic evolution [12, 13]. An additional UPD was identified at 14q in the follow-up study 5 months later, confirming the genetic progression of disease (Figure 6). 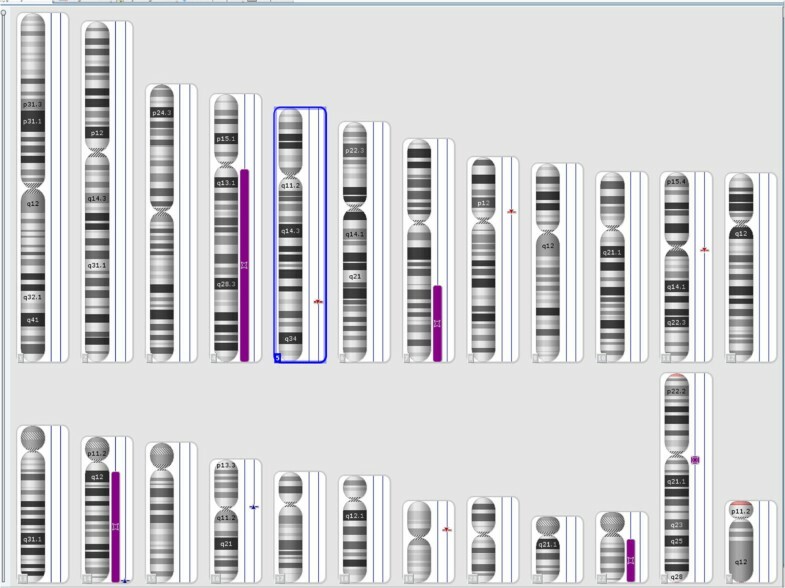 SNP-array results at diagnosis showing loss of heterozygosity (LOH) at the long arm of chromosomes 4, 7, and 22 as purple bars next to the corresponding chromosomes. SNP-array results at the follow-up study showing loss of heterozygosity (LOH) of chromosome 14, in addition to the LOH chromosomes 4, 7, and 22 found at initial diagnosis. LOH is shown as purple bar next to the corresponding chromosome. Recent investigations have indicated that cnLOH can be responsible for homozygosity of mutations in critical genes within the region. Reduction to homozygosity as a consequence of cnLOH was initially thought to be a mechanism for only inactivation of tumor suppressor genes [14, 41, 42]; however, identification of cnLOH in leukemia has shown that oncogeneic mutations are also targeted [13, 16, 17]. Mutation analysis of 19 MDS-associated genes revealed an ASXL1 frameshift/stop mutation (Y591*, 41% of reads), an EZH2 point mutation (R690H, 85%), two RUNX1 frameshift/stop mutations (c.474dupT, 19% and c.424_425ins11bp, 7%), and two TET2 frameshift/stop mutations (c.1510_1513delAAAA, 77% and R1465*, 10%). These mutated genes are located on chromosomes 20, 7, 21, and 4, respectively. Recent studies have shown that TET2 mutations are present in up to 30% of MDS/MPN cases, with mutations in ASXL1, EZH2, and RUNX1 also commonly reported . The finding of mutations in all four of these myeloid regulatory genes suggests that they play a critical role in the pathogenesis of this case and demonstrate that mutation analysis is useful in cytogenetically normal myeloid disorders . The cnLOH affecting chromosome 7q and homozygous EZH2 mutation have been reported in 10% of AML and MDS cases. They have been associated with a poor prognosis [9, 26, 44] and clonal evolution [45, 46], supporting the possible role of EZH2 as a tumor suppressor gene for myeloid malignancies. In contrast to the mutated TET2 and EZH2 genes, no LOH was found for the other two mutated genes (RUNX1 and ASXL1). RUNX1 mutations have been proposed as clinically useful biomarkers to follow disease progression from MDS to AML as well as to monitor minimal residual disease (MRD) . Moreover, RUNX1 mutations were demonstrated to be frequent in de novo AML with non-complex karyotypes and conferred an unfavorable prognosis  explained by an association with resistance to chemotherapy . Mutations in ASXL1 have been identified in MDS, AML, chronic myeloid leukemia, chronic myelomonocytic leukemia (CMML), and juvenile myelomonocytic leukemia [50–54], and act as a tumor suppressor in myeloid malignancies . Mutations in ASXL1, TET2, and EZH2 have been found in 41% of MDS cases in a Chinese population , similar to the data reported in patients of European decent with MDS [21, 23, 24, 55, 56]. In conclusion, our study identified four large cnLOH and a microdeletion at 5q31 harboring two tumor suppressor genes (CTNNA1 and HSPA9) in an MDS case with an apparently normal karyotype. The regions of cnLOH at chromosomes 4, 7, 14, and 22 confirm and extend previous studies, supporting that cnLOHs in myeloid disorders are common and nonrandom. Moreover, the presence of an additional aUPD 14q at follow up, along with persistence of the 5q31 microdeletion and all cnLOHs detected at presentation, indicates genetic progression of the disease. The deletion of tumor suppressor genes CTNNA1 and HSPA9, along with mutation of candidate myeloid regulatory genes TET2 and EZH2, supports the diagnosis of MDS and likely portends a poor prognosis. This study attests to the fact that some patients with a myelodysplastic syndrome exhibiting a normal karyotype may have underlying genetic abnormalities detectable by chromosomal microarray and/or targeted mutation analyses. Further genomic and molecular studies on a series of patients with MDS may yield information on how to stratify this category of disease to seek further molecular definition. These studies were performed on anonymized samples received in the clinical laboratory and thus were exempted from the requirement for consent by an opinion for the Western Institutional Review Board. The authors would like to express their thanks to Maryam Talai and Robert Mcgough (Quest Diagnostics) for their technical support. MH, First author; performed chromosome, FISH, and microarray analysis, interpretation of the results, drafting and finalization of the manuscript. WC performed the morphology and immunophenotypic analysis. DJ and YW performed the genomic sequencing. FR performed the comprehensive review of the clinical and laboratory findings. AA reviewed and reported the SNP-array analyses. MEN reviewed the manuscript. FZB reviewed and finalized the manuscript. All authors read and approved the final manuscript.